Finding out that your home or business has a code violation is not fun. Not only is it scary to think that you have a violation, but it can also be costly. While some people may scoff at the notion of having to adhere to the electrical code (It’s my home after all. Can’t I do whatever I want? ), you should know that the electrical code is in place for safety. This is precisely why it is so important to make sure that all your electrical work is done by a professional who knows and adheres to electrical code. If you happen to find out that you are in violation of electrical code either in your home or at your business, it is time to call a professional electrician immediately. They will then guide you through the process of having a professional come in to remedy a code violation. If you already have a code violation, please contact us as soon as possible. To avoid electrical code violations and protect your safety, you should have a professional electrician handle any electrical work that you need to be completed in your home or business. • We select the right outlet for the specific electrical job. • We make sure to install neutral wiring. • We use tamper-resistant receptacles. • We install enough receptacles to meet your needs and avoid the use of extension cords. 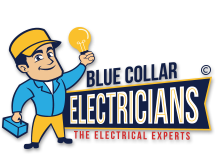 If you are looking to work with a professional electrician or recently found out about a code violation, it’s time to call Blue Collar Electricians.